Grouping is a design principle that wasn’t covered in my book, but it’s a good one. When you arrange information, their proximity and placement lead the viewer to believe they belong together. 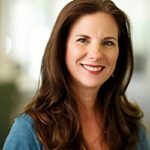 Meaning can dramatically change the context of content. 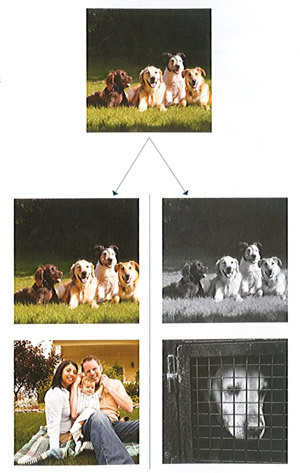 In the example to the left, our emotional response to the dog image changes dramatically when it is placed with an image of a young family or converted to grayscale and paired with a photograph of a cage. They also referenced a fascinating study on the ClearviewHwy type design project. The objective of the study was to create a font used in freeway signs that increased the distance of legibility. The goal was to improve safety and increase the distance of visibility for the visually impaired. This is important as the average age gets older every year. So, if my premise is true that slides are like road signs, looks like sans serif has won again! A nice nod to Richard Saul Wurman’s LATCH theory of organization is a must-have in a book like this. I covered it in an earlier post.